Katy has a really pretty flower print dress and fantastic bright stripy tights. She has blonde hair tied in bunches and a sweet happy smile. A delightful rag doll that's sure to become a favourite guest at tea parties. 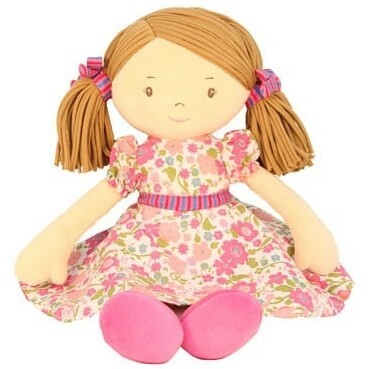 These rag dolls by Imajo are hand made in Sri Lanka. They are made in a factory which operates a fair trade policy, workers receive a fair wage and many other additional benefits. Holidays are paid as well as religious and bank holidays and female workers receive maternity pay and their jobs a open for when they return. The materials are bought in the local area supporting the community. Generally good all round really!